India has about 600+ million mobile phone users with about 800+ million subscriptions (SIM Cards base). About, 60% of these users are in Urban India. Now, imagine converting all those mobile users to smartphone users. Thanks to its population, India is a huge market for smartphone manufacturers. In the coming 2 years, smartphone manufacturers look to cannibalize a large pie of the feature phone market in India, and supply trends like the narrowing price-gap between the feature phone and smartphone, and the entry of more handset makers are accelerating smartphone adoption in India. Smartphone has a very high aspirational value, and people will adopt it in the first opportunity. It is only time that smartphones will be everywhere in Urban India. 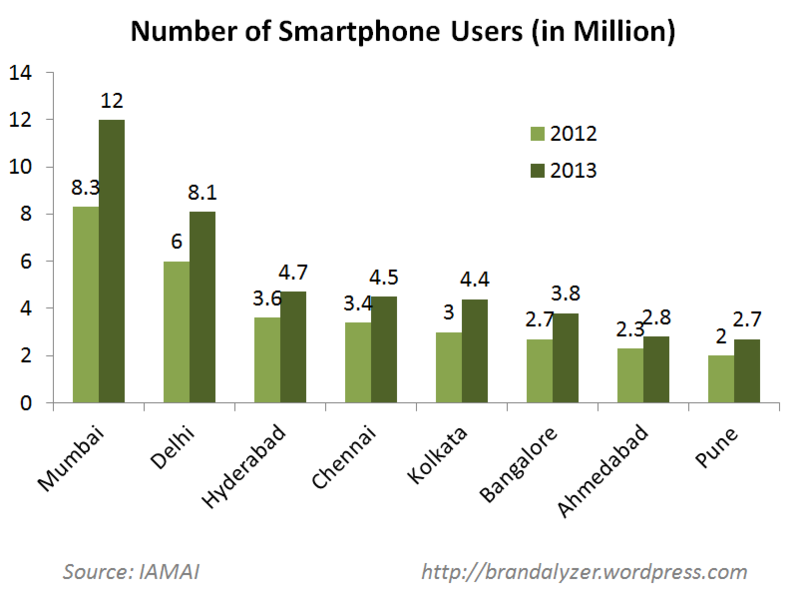 So, how is a smartphone defined, how many smartphone users are there in India, and what is the growth? 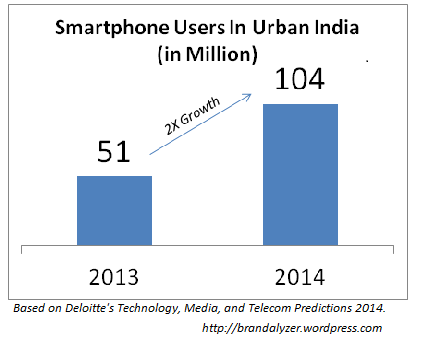 According to Nielsen’s report released in Sep’2013, there are 51 million smartphone users in Urban India. Nielsen’s definition of smartphone is ‘phones with operating systems that allow installation of applications’. According to IDC APEJ Quarterly Mobile Phone Tracker, companies have shipped 12.8 million units in Q3’2013 and 10 million units in Q2’2013. There is a 229 percent y-o-y growth compared to the Q3’2012 number of 3.8 million units. If we assume a quarter on quarter growth of 20%, the number of smartphone users in Urban India will reach 105 Mn by Sep’2014. Deloitte’s technology, media, and telecommunications predictions revealed on 31 Jan, 2014 say that the number of smartphone users in Urban India will cross 104 million in 2014. According to Internet and Mobile Association of India (IAMAI), Mumbai has the highest number of smartphone users followed by Delhi. Where does India stand in the global smartphone market? According to a recent report by the market research firm Mediacells, there will be 1.05 billion smartphones shipped in 2014, and 70% of those smartphones will be bought by new users and 30% will be bought by existing users as replacements. Mediacells estimates that India (Urban & Rural) will add 172 million smartphones in 2014 to have a total of 250 million smartphone users. Even if India is going to add about half that number of users (90 million – Urban 50 + Rural 40), India is going to have 160-170 Mn smartphone users by the end of 2014. 170Mn is a huge number, and remember this is a semi-optimistic estimate. India will be the second largest smartphone market in the world, surpassing U.S. and behind only China. In Q1 of 2018 the smartphone market was stagnant while the demand for feature phones increased. I guess it is because of the dismal employment scenario in the country. People want to buy smartphones but they don’t have money so they make do with feature phones.